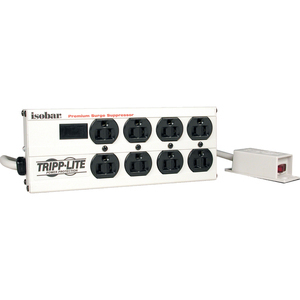 Tripp Lite's Isobar 8 RM Surge Suppressor has 8 outlets, a 12' cord, remote power switch on 9' cord, and 3,840 joules of energy absorption. Exclusive isolated filter banks eliminate interference between connected equipment. Isobars are virtually indestructible with their heavy-duty all-metal housing which won't burn, crack, or melt. The Isobar 8 RM comes with child safety covers. 9" x 2.5" x 3.5"